“Pictures mark an increase in the symbolic tenor of the discourse of anorexia,” writes Erin O’Connor in her study of how late-19th century medical photography came to frame anorexia nervosa as a discrete pathology. Wresting the representation of anorexia (and eating disorders more generally) from the realms of medical science, contemporary writers and artists have turned to a different pictorial form—the graphic form—creating a profusion of narratives including British artist Katie Green’s debut memoir, Lighter Than My Shadow (2013). In My Shadow, Green depicts Katie’s experience with eating disorders—beginning with childhood anorexia—anxiety, and traumatic sexual abuse, by marrying an array of contradictory styles. Through scenes unfolding along grayscale gradients punctuated by breaths of muted color, Green manages to paint pages that feel claustrophobic and oppressive one moment and airy and lighthearted the next. Green’s line work is also both minimalist and lavish, and comes most captivatingly alive in dynamic scribbles that shape-shift across pages as characters of their own. The shadow is a richly symbolic figure, enabling Green to push formal and thematic boundaries. On occasion, the shadow functions as a gutter, transforming separate images into single ideas and fracturing both time and space. But more interestingly, Katie’s complex interiority is made almost always hyper-visible through the shadow. The shadow is with Katie from childhood and grows on the page to represent an increasingly agitated psychological state of mind. As the narrative progresses, the shadow arguably becomes the embodiment of Katie’s anorexia. On page 105, it emerges out of Katie’s throat, making visible the urge to vomit, and it also mimics the loss and recovery of consciousness due to self-starvation (142-147). And while the shadow is a threatening presence, it is also a companion, an inextricable part of herself, and the fodder for her artistic practice. The shadow forms a part of Katie’s own pen on page 7, speaking to the complexities of her embodiment as a creative resource. On page 35, the shape of the shadow curves down to a taper of a thought or idea—the genesis of her self-articulation through the graphic memoir she comes to write in the future. The dynamic functions and meanings of the shadow elude conclusive definition, helping the narrative explore the multidimensional experience of Katie’s subjectivity without recourse to the totalizing trope of the anorexic artist. In addition to the shadow, Green experiments with visualizing other “excessive” images of the body, such as the bloated female figure and a disembodied mouth that threatens to consume the very page it occupies. Just as Katie envisions her body as “somehow out of proportion” the presence of the body in the memoir helps visualize surprising iconographies of illness that push the boundaries of formal harmony (89). Holding space for the pictorial presence of the body on the page, Green’s graphic text resists the dominant expectation that the writing (or drawing) of anorexia is predicated on the erasure of the body and self. Green draws further attention to the (re)making of the body through the use of scanned edges of creased and torn paper to create panels. Drawing readers’ attention to the materiality of the graphic form, the paper also reflects Katie’s sense of vulnerability and the contingency of her body. Consider the images that appear at the pivotal moment of Katie recognizing her sexual abuse and attempting suicide (381-83). In this scene, we see visible rips in the physical page for the first time, signaling violent, self-destructive emotions. On the next page, we see the same image, but torn into pieces. We can view this as a powerful act of vandalism on Katie’s part, in which she creates a new image, reclaiming her sense of self. In the pages that follow, readers are confronted with the only section of white paper in the entire text—a clean slate on which Katie begins to redraw herself. Green’s work is not an ode to a missing presence, but a text that makes manifest the materiality of the self and effects of social injury that refuse to be ignored. Most profoundly, My Shadow reads as both an exploration of Katie’s fraught relationship with consumption and a meditation on our reading practices when the subjects at hand are bodily difference and traumatic experience. As Hillary Chute aptly argues in Graphic Women, a particular affordance of the graphic form is the more flexible “pace of consumption” ceded to the reader, one that allows for re-readings and slower engagement. The pace and style shifts in My Shadow are both frenetic and tempered, moving in tumultuous waves to mimic the non-linear experience of an eating disorder and traumatic stress. Katie’s experience thus implicates her readers in their own textual consumption, and we are asked to reflect critically on our visual hunger for bodily otherness and the way engage with such images. Taking full advantage of the graphic form, My Shadow puts forth a readerly ethics of prolonged engagement. By its conclusion, Katie’s story is not of complete recovery, but a realization and acceptance of her impairment’s complexity and open-endedness. Green frames this as a realization that “seemed to happen in slow motion” (481). Up until this point, motion has been represented in a consistent fashion: through multiple sequential images and minimal use of motion lines. But here, Green breaks convention and employs zip-ribbons/streaking effects alongside multiple images of Katie. These slow motion effects draw the reader deeply into the action so that they, too, can “hear” with Katie the meanings they’ve been missing. In the following page, the multiple images of Katie have slowed so drastically that the Katie of the past is able to reach forward and comfort the Katie of the present (482-83). Green visualizes how present and past inflect one another in a dialectical process toward healing (which is not necessarily predicated on a cure), a process that requires slowing down to perceive. Crystal Yin Lie (clie@umich.edu) is a PhD Candidate in English Language & Literature at the University of Michigan–Ann Arbor writing a dissertation about disability, temporality, and form in contemporary literature and life writing. 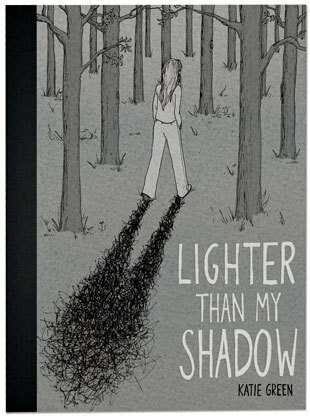 This is an enormous book–longer and heavier than any other graphic memoir I’ve ever handled. It seems aimed primarily at young women, and that’s fine, considering the condition in question, anorexia, commonly begins among that demographic group. It’s also a graphic memoir that uses relatively few words, relying on the images to carry the story, and it uses the medium quite imaginatively. I recommend it.